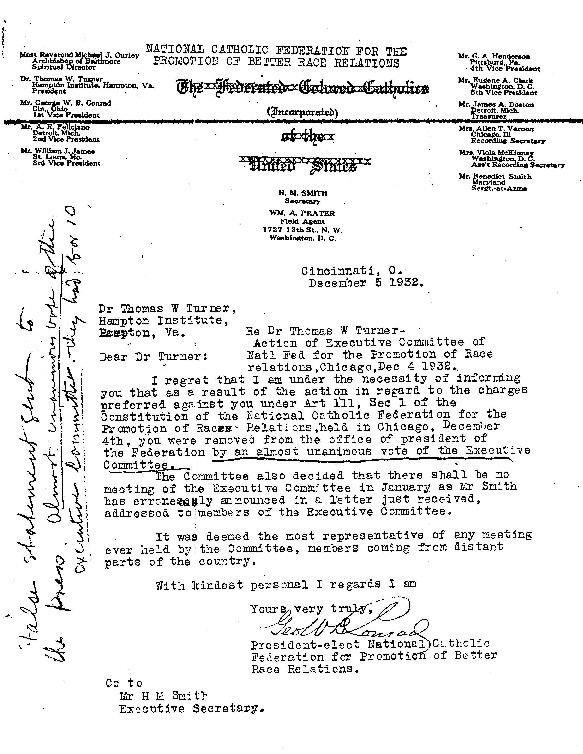 In the wake of the 1932 FCC convention, one at which the delegates debated changing the organization's name and that of its official organ, Turner publicly and vocally objected to the proposed changes. Characterized by Father Markoe's supporters as "false publicity," "impudence," "treason," and an "unwarranted assumption of authority," Turner's objections led to his being ousted from the presidency of the FCC. In this document George W. B. Conrad, the president-elect of the renamed National Catholic Federation for the Promotion of Better Race Relations, informed Turner of his removal. What office did Conrad hold in the FCC? What office did he hold in the National Catholic Federation for the Promotion of Better Race Relations? What are some of the physical features of the letter that stand out to you? How do you think Turner reacted when he received the letter? Is there any evidence of his reaction in this letter? If there is, what is it?